Bigger and better than before, the iPad Pro retains its predecessor’s thin, lightweight design yet boosts your viewing pleasure as it’s fitted with a 12.9-inch Retina display. While the size of the space gold Apple 256GB iPad Pro may be a bit daunting, its 12.9" Retina Display will quickly remove your doubts, thanks to its 2732 x 2048 screen resolution, 264 pixels per inch (ppi), and 5.6 million pixels. Supporting high resolution videos and photos, you'll be able to experience vivid colors and deep black levels. The Retina Display delivers greater contrast, more uniform brightness, and improved energy efficiency through photo alignment technology, oxide TFT, and variable refresh rate. 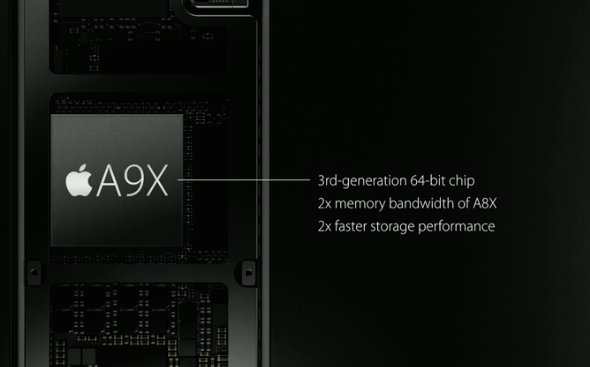 Powering the large Retina display is the Apple A9X chip with a M9 motion coprocessor. The 3rd generation 64-bit chip can pump out desktop-class CPU performance and console-class graphics. The faster performance allows you to multitask with ease, using iOS 9 features, such as Picture in Picture, Slide Over, and Split View. Also, the iPad Pro is capable of playing three simultaneous 4K video streams in iMovie. 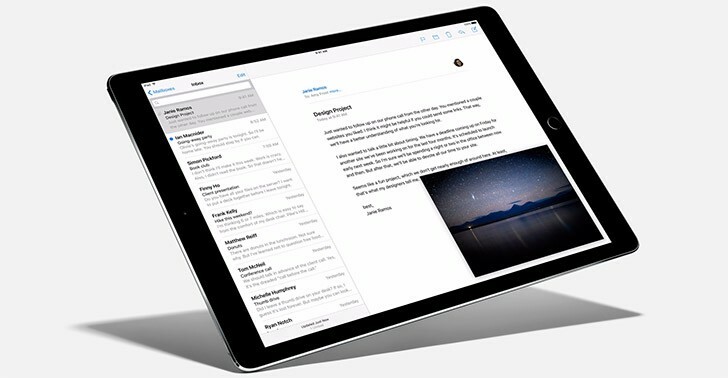 The iPad Pro is the fastest, most powerful iPad ever thanks to its 64-bit A9X chip. This third-generation chip delivers speed and graphics that are comparable to PCs, allowing you to perform tasks you would have once only done on your desktop. The responsiveness has also been improved to make complex tasks such as editing 4K videos or retouching 3D designs as seamless as possible, while the revamped controller works to increase the read and write speeds to let you easily open large files and rapidly switch between programmes and pages. On top of the stunning graphics, the iPad Pro 9.7" has a Multi-Touch sub-system to give you the option to use your finger or an Apple Pencil when interacting with the device. Apple has made the images look better on iPad Pro by improving the alignment of the display’s liquid crystal molecules to enhance the contrast on your photos. Take incredible photos and videos with the amazing iSight and FaceTime HD cameras. The new iSight camera features an 8 megapixel sensor that can capture images in 3264 x 2448 pixels and videos in Full HD 1080p. That ensures that your images stay sharp and clear, even on larger screens. An improved image processor is better at detecting faces and keeping them in focus, as well as reducing noise to ensure cleaner, sharper images. The front-facing FaceTime HD camera features a wider aperture, image stabilisation, improved face detection and 3x video zoom to let you capture your magic moments when you’re out and about with your family and friends. The improved zoom function and face detection means you will be able to record your children as they make their stage debut in the school play even if you’re on not on the front row. With high-fidelity speakers in each corner that automatically adjust to orientate the high frequency to the top speakers, giving you the clearest audio experience no matter which way up you hold the device. The iPad Pro features an unprecedented level of security thanks to Touch ID. Touch ID lets you use your fingerprint as your password, letting you unlock your iPad or make secure purchases on the App Store, iTunes and iBooks. Your fingerprint information stays on your iPad- it’s not shared with anyone, even Apple, helping to ensure that your personal information remains private. iOS 9 has been enhanced to make it more essential than ever. Get smarter suggestions from Siri, be more productive with new multitasking features and enjoy enhanced performance and security thanks to improvements to the very foundation of iOS. It comes with powerful apps already installed that make every day easier, while existing features, like QuickType, have been enhanced to help you say what you want quicker and easier than ever. And if you're new to iPad, it's easier than ever to set things up, with the Move to iOS app, which securely transfers your contacts, message history, camera photos and videos, web bookmarks, mail accounts, calendars, wallpaper, and DRM-free songs and books from an Android device. It'll even suggest you download any free apps you were using on your old device. The iOS 9 also comes with an amazing collection of apps, so you can start making the most of your iPad, straight out of the box. Take photos and videos and edit them on the go. Make video calls with FaceTime and send emails. Organise your life with Siri, Maps and the Calendar app. Plus, with over one million apps available on the App Store, you'll find plenty of options to do almost anything you can imagine.